As avid family campers, Chris and Jean Swaggert wanted to create an experience for others that incorporated everything they loved about camping. Escaping from the hustle and bustle of everyday life. Spending quality time with their children. Creating family memories and traditions. Surrounding themselves with the fun, adventure and restoring powers of nature. Read more. 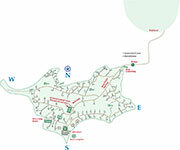 Click on the map of the Island for a larger version. Click here to view our new Take a Hike map for walkers, joggers and bikers. Let the countdown to summer begin! Campers' Paradise opens for your best summer vacation ever on Friday, May 24. For our return guests -- watch your mail! Pre-booked reservation confirmation letters went out March 1. We'll start taking new reservations April 15. In the meantime, check out our website and begin planning your getaway to the Island. When you escape to Paradise – Campers’ Paradise – you'll experience family camping the way it was meant to be. Located on a private island in beautiful Lake Belle Taine in Minnesota’s northern lake country, Campers’ Paradise is a unique, destination campground. The perfect destination for your family vacation, reunion or to utterly relax on Island time. For an alternative camping experience, consider staying in one of our three historic lakeside camping cabins. Attention boaters! Help us keep Lake Belle Taine free from aquatic invasive species. Please fill out this one-page form before you arrive, and check out our new policy on boat launching. Everyone who loves Belle Taine thanks you! WCCO's "Goin' to the Lake" summer-long series featured Campers' Paradise! Read more in News from the Island. We're looking for summer help to keep Campers' Paradise running smoothly. Check out the job posting on our Staff page. Stay up-to-date with events at Campers' Paradise by reading our News from the Island. Chosen 2014 "Best Private Campground in Minnesota" by the Minneapolis StarTribune! Copyright © 2010-2016 Campers' Paradise. All rights reserved.